On the 26th (Wed), contemplate the long history of Westminster Abbey. Get ready for a full day of sightseeing on the next day: take in panoramic vistas at Coca-Cola London Eye, then take in nature's colorful creations at Buckingham Palace, and then learn more about the world around you at Natural History Museum. For traveler tips, where to stay, and tourist information, use the London trip planner . Singapore, Singapore to London is an approximately 16-hour flight. You can also do a combination of flight and train; or do a combination of bus and flight. You'll gain 8 hours traveling from Singapore to London due to the time zone difference. Plan for cooler temperatures traveling from Singapore in December, with highs in London at 11°C and lows at 4°C. Cap off your sightseeing on the 29th (Sat) early enough to catch the train to Manchester. On the 29th (Sat), test your problem-solving skills at popular escape rooms and then engage your brain at Museum of Science & Industry. To see maps, reviews, other places to visit, and more tourist information, read Manchester road trip website . You can take a train from London to Manchester in 2.5 hours. Other options are to fly; or drive. Expect a daytime high around 10°C in December, and nighttime lows around 3°C. Cap off your sightseeing on the 29th (Sat) early enough to travel to Paris. Kick off your visit on the 30th (Sun): see the interesting displays at Musee Rodin, then contemplate the long history of Basilica du Sacre-Coeur de Montmartre, and then don't miss a visit to Champs-Elysees. 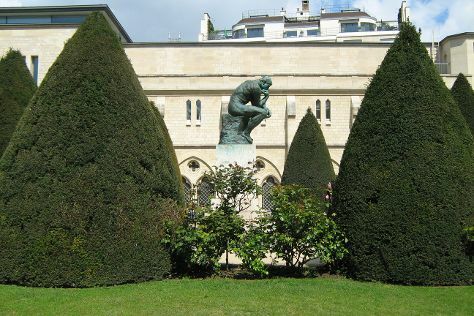 Keep things going the next day: admire the natural beauty at Luxembourg Gardens and then admire the masterpieces at Centre National d'Art et de Culture George Pompidou. To find more things to do, ratings, reviews, and other tourist information, you can read our Paris trip planner . Traveling by flight from Manchester to Paris takes 4.5 hours. Alternatively, you can do a combination of bus and flight; or take a train. The time zone difference when traveling from Manchester to Paris is 1 hour. In December, plan for daily highs up to 9°C, and evening lows to 3°C. Cap off your sightseeing on the 31st (Mon) early enough to catch the train to London. On the 1st (Tue), you'll have a packed day of sightseeing: take in panoramic vistas at Sky Garden, then see the interesting displays at Madame Tussauds London, then tour the pleasant surroundings at Hyde Park, and finally browse the range of quality goods at Harrods. Getting from Paris to London by train takes about 2.5 hours. Other options: fly; or do a combination of train, bus, and flight. Due to the time zone difference, you'll gain 1 hour traveling from Paris to London. You will have some time to spend on the 3rd (Thu) before leaving for home.